planet manners: USA: Cheyenne Frontier Days Rodeo Update - Big Loop Rodeo Loses a Major Sponsor! USA: Cheyenne Frontier Days Rodeo Update - Big Loop Rodeo Loses a Major Sponsor! Subject: Cheyenne Frontier Days Rodeo Update - Big Loop Rodeo Loses a Major Sponsor! Big Loop Rodeo Loses a Major Sponsor! SHARK has been at the Cheyenne Frontier Days Rodeo (CFD) for a week, and we are sorry to report that the abuse and cruelty continues on a daily basis. Here are links to all of the videos we've uploaded so far. Many more will follow. 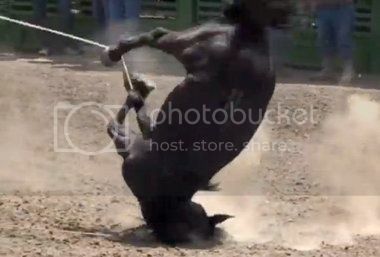 When SHARK released videos exposing the brutal and violent Jordan Valley Big Loop Rodeo in Oregon, not only was the debate to ban horse tripping reignited, but we put pressure on sponsors to no longer support such animal cruelty. "We have no pending or future sponsorship commitments to the Big Loop Rodeo. We are pursuing other ways to support the community of Jordan Valley." We want to thank all of you who wrote and called Idaho Power. Thanks to your efforts, they saw the light! "Jimmy Siler, the Law Enforcement Administrator for the Wyoming Livestock Board, said Peterson admitted he was getting frustrated with his horse trying to put it in the trailer. So he took out his gun and shot at it. The owner said he was planning on taking it to the vet the next day."